Classifieds Blaster can be one of the most useful tools for any online marketer. By running your own classifieds blaster you can allow others to blast an ads to tons of classifieds sites with just 1 click and charge them monthly or one time membership fee. This script contains an excellent ad selling feature for you by which you can sell top and bottom sponsor ads at your website and make good money from it. We had already written some good sales text for your classifieds blaster so you can start your blaster right away. 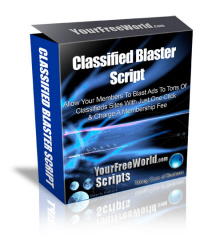 Click here to view Classifieds Blaster Script Demo. Customise the welcome, account upgrade, referral notification and other emails.